Birthdays, celebrations and gatherings can become even more meaningful when engaging in art making together. 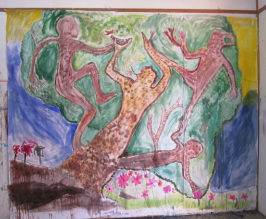 Painting, drawing, mask making or group murals or sculptures are all wonderful ways to be together! Please call or email to discuss what would best suit your occasion. There are so many fun creative options to explore in the studio or outside with friends, family, and community! Have you ever tried painting with your family or friends? Have you ever tried painting a painting that represents your family and some of the relationships between family members? Engage in Family Drawing the Inside Out. It's fun, and a great way to explore family relationships and dynamics--together!! Mask making is another great art activity families and friends can share in!